St Edward ball on Colerain 1. Colerain returns the kickoff to the St Edward 37. Much lower scoring game than I expected. Colerain ball on St Edward 37. Colerain ball on St Edward 18. Colerain ball on St Edward 16. 2nd and 8. Colerain ball on St Edward 8. St Edward ball on their 37. St Edward ball on Colerain 48. 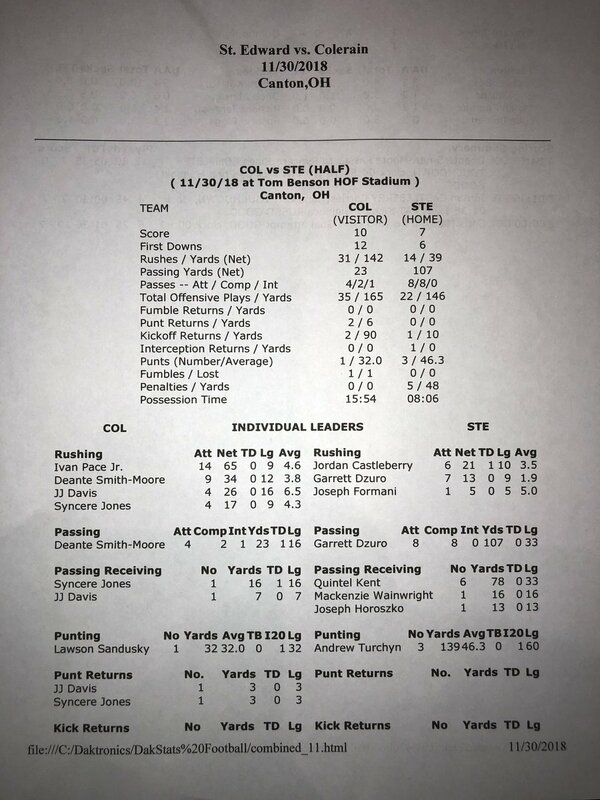 St Edward ball on Colerain 21. St Edward ball on Colerain 8. St Edward onside kick. St Edward recovers at the Colerain 49. St Edward ball on Colerain 49. 4-punting...Colerain returns it to their 27. Colerain ball at their 27. St Edward ball on their 42. St Edward ball on 25. Colerain returns the kickoff to their 34. Colerain ball on their 34. Colerain ball on the 50. Thanks for the play by play updates! Colerain ball on their 45. 1st and 15. St Edward ball on their 12. St Edward ball on their 25.